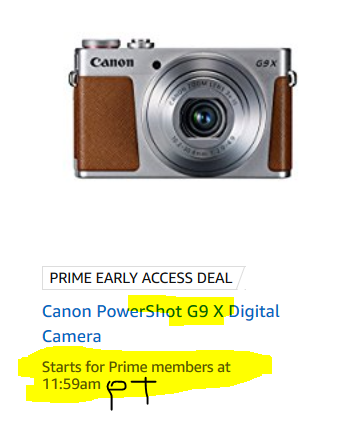 The new condition Canon G9X rawsumer lightning deal in the Gold Box that was randomly teased there yesterday now has a concrete date per the Gold Box! It will start at 2:59pm eastern time (11:59am pacific time). The price before the sale is $379. The sale price will be revealed there at 3pm ET. Note also that this is the previous generation model. The latest model is the G9X II.